This is a very simplistic chart that can help with pricing decisions. 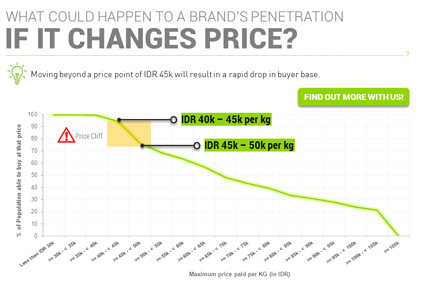 This study will estimate the impact on penetration levels if a brand changes price. The chart on the right is a very simplistic chart that can help with pricing decisions. It assumes that the maximum price ever paid by a consumer represents the maximum they would ever be willing to pay. The output can be used to see how many potential consumers could be capable of buying a brand if the price is reduced or how many consumers could leave the brand if the price is increased. This assumes that consumers will retain their maximum price level. Currently only around 70% of the population are able to purchase at the IDR 45k - 50k per KG. If we are able to decrease price to IDR 40k - 45k per KG, we will be more easily able to attract an additional 20% of the population.